I recently am all out of laundry soap, and had heard some families make laundry soap. I googled it, and came upon this guy's blog.. I read stuff from him before. 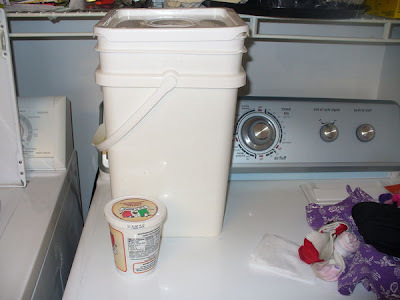 So apparently with $10 worth of materials you can make 4 gallons of laundry soap in a home depot bucket. 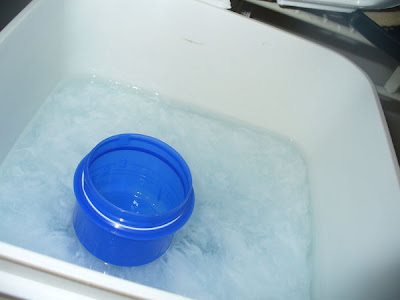 Plus, you only use 1 cup of the washing soda, and 1/2 cup of the borax...so that stuff can last for future batches. Anyone ever made laundry soap before? Well, I finally did it. Got the "20 mule team borax" and "washing soda" at Jewel-Osco (of all places) because they didn't sell it near anywhere else. Walmart, Target, home depot and menards didn't have it. I used a bar of Ivory Soap, because I thought the whole "so pure it floats" will make it ok for my kids and I who get the winter dry skin. My husband took the Paint mixer attachment onto the power drill, and mixed everything up in a 3/4 gallon food-grade bucket we got from a restaurant owner friend. I have to say, it's been a few weeks we've been using it, and although it doesn't "suds up" like the other soaps, it cleans just as well. I will upload a few pix I took of ths finished product. I used 1 cup of the washing soda, and 1/2 cup of borax, so I still have tons left in the box to make at least 10 more batches of this. What the soap look slike. The website said "chunky looking things" are to be expected. It is the Ivory re-coagulating. A couple days after that, I know my husband has come a long way because when we ran out of dryer sheets he asked "IS there a recipe on how to make dryer sheets?" Sure enough there are tons on the internet. It's basically Fabric softener and water. So I took all those baby washclothes we've had lying around and put them in a tub of fabric softener with a little water added to it. Everytime we put the clothes in the dryer, I lightly wring a baby washcloth and throw it into the dryer. 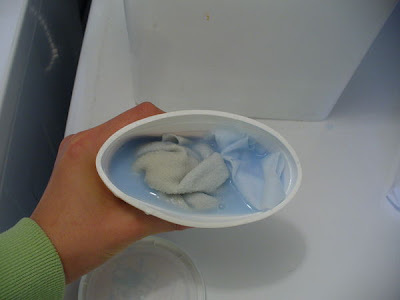 Babycloths in a tub of fabric softener and water. $8.00 for bottle of fabric softener that is Huuuge. $4 for the borax and $3 for the Washing soda. When I called the Arm+Hammer company to ask where I can buy washing soda, they offered to sell it to me for $2.50 plus free shipping. I would have jumped at that deal if not for the fact that I had piles of laundry that needed to be done NOW. But I did ask them to send me out a coupon, which arrived yesterday for $1.00 off my next purchase of washing soda. The Raw ingredients Look to last us over a year for sure!